Jumpstart your car without cables. 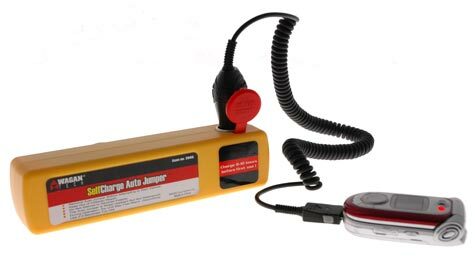 The SelfCharge Auto Jumper eliminates the need for jumper cables, having to work under the hood, and most importantly, needing another car. 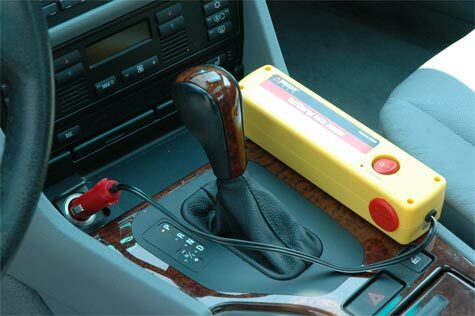 If your weak battery needs a jump, simply plug the Auto Jumper into your car's cigarette lighter, and rest assured that you'll be driving in no time. The Auto Jumper also doubles as a portable back-up for cell phones, laptops, or any other device that can be powered by a cigarette lighter adapter. The beauty of this product is that it allows you to jump a weak battery without needing another car. Suppose you're in an empty parking lot and there's no help nearby. Simply plug your SelfCharge Auto Jumper into your car's cigarette lighter and within 10 minutes, you'll be ready to go. 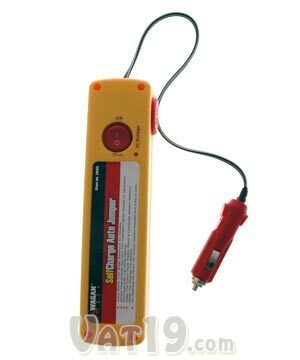 Jump start a weak battery in 10 minutes. Because all of your battery's charging is taking place through your car's cigarette adapter, you don't need to hook up cables under your hood. You also don't need another vehicle (and good samaritan) to help you out. You'll never need jumper cables again with the SelfCharge Auto Jumper. The SelfCharge Auto Jumper is essentially a large battery. Charge it up using the included AC adapter (or by plugging it into your car's cigarette lighter when the car is running) and then keep it in your trunk in case of an emergency. The included 12V DC input allows you to use your SelfCharge Auto Jumper to recharge your cell phone or PDA. You can even use the SelfCharge Auto Jumper to charge a cell phone, PDA or other device using the 12V cigarette input. Plug the SelfCharge Auto Jumper into your car's cigarette adapter while you're changing a dead battery and preserve all of your car's settings. It's annoying to reset all of your favorite radio stations and clock (if you can even figure out how to set it!). 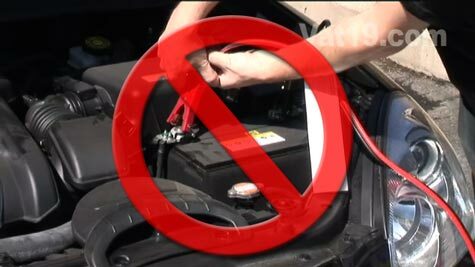 Avoid this minor frustration (as well as the major frustration of a car that won't start) with the SelfCharge Auto Jumper.